Corruption. What image does the word corruption conjure up? 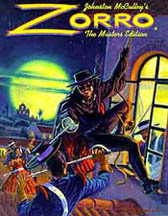 How about the story of Zorro? "Old California, in a bygone era of sprawling haciendas and haughty cabelleros, suffers beneath the whip-lash of oppression. Missions are pillaged, native peasants are abused, and innocent men and women are persecuted by the corrupt governor and his army. But a champion of freedom rides the highways. His identity hidden behind a mask, the laughing outlaw Zorro defies the tyrant's might. A deadly marksman and a demon swordsman, his flashing blade leaves behind... THE MARK OF ZORRO ..."
We doubt that anyone would make an argument as to how corruption might be beneficial (except, of course, to the perpetuators). However, we wish to address a couple of other practices that are not necessarily synonymous with corruption. A formal definition of patronage is "the power of appointing people to governmental or political positions" and "the positions so distributed" (Webster’s II New College Dictionary 1995). Generally, the word patronage has a negative connotation that this straight-forward definition fails to convey. Patronage suggests the transgression of real or perceived boundaries of legitimate political influence, the violation of principles of merit and competition in civil service recruitment and promotion. Nonetheless, it is important to recognize that governments the world-over accept that some political appointments are fully legitimate. A small number of these appointments are justified as a means for political leaders to fashion a circle of government policymakers and managers who share a common agenda. Patronage is clearly a problem, however, when these appointments pervade public administration, severely undermining merit principles. Somewhere between these two extremes the line between appropriate and inappropriate uses of patronage is crossed. In Roman law, clients were liberated slaves or immigrants who sought the protection of a patrician paterfamilias. They were dependent on the head of the family, as were all the other members of the household and, in exchange for protection, they were expected to render services. In contemporary political science, clientelism has assumed a generalized meaning. It is now seen as a network of social relations where personal loyalty to the patron prevails against the modern alternatives of market relations, democratic decision making, and professionalism in public bureaucracies. Clientelism and corruption are different notions. Clientelism is a form of social organization, while corruption is an individual social behavior (where you are your own client, trying to play patron to yourself) that may or may not grow into a mass phenomenon. One can imagine clientelism without corruption, although the two often go hand in hand. The wording of these definitions certainly conveys an ambivalence as to whether patronage and clientelism are inherently evil. In an idealistic scenario: a concerned citizen wishes to serve the public and therefore runs for elective office; his campaign was supported by others with similar opinions and vision, and he received help in the form of money, resources and time; he wins his election; to implement his vision, he brings people that he knows and trusts to help him; and he allocates resources to help those whose needs he understood. What is so wrong about that? Nothing at all, for this is the way how the best democracies are supposed to function. In the counter-scenario, a cynical citizen decides to run for elective office for self-enrichment and self-aggrandizement; he solicits the backing of special interest groups and receives enormous amounts of monetary contributions with which he bought manpower and advertising for his campaign; he wins his election; he allocates plum jobs, assignments, projects and contracts to his supporters; he keeps an open-door policy by which any vote, policy or influence can be peddled for the right price. That becomes a case of immoral corruption. Political scientist Marcos Coimbra, director of [the polling firm] Vox Populi, observes that public opinion tends to draw hasty conclusions from a few striking facts. This behavior can be observed in most countries, including Brazil. When it was discovered that PC [Paulo César] Farias [treasurer of the 1989 election campaign of Brazil’s former President Fernando Collor de Mello] ran his corruption scheme from within Collor’s government, public opinion pronounced that Brazil was rotten to the core. We will now cite some survey data from the TGI Brasil study. This is a survey of 10,624 persons between the ages of 12 to 64 years old interviewed during 2001. These survey respondents were presented with the statement "If I were a politician, I would help my friends first." There is no value, either positive or negative, attached to this statement. According to the TGI Brasil study, 12% of the survey respondents 'completely agreed' with the statement. In the next table, we show the demographic breakdown of the responses. "If I were a politician, I would help my friends first"
The agree rate with the idea that politicians should help their friends first is highest amongst older, poorer, less educated and unemployed people. These are precisely the most vulnerable people for whom regular channels may be closed or impossible to navigate and for whom personal access to politicians is often much more effective. "The people need only elect their leaders so that they do what the people want...and the generals should serve the governments of the people with clear and absolute awareness that nothing in the Nation can override or oppose the will of the people." "I love the descamisados, the women, the workers of my people too much , and, by extension, I love all the world's exploited people, condemned to death by imperialisms and privileges of land ownership, too much... The suffering of the poor, the humble, the great pain of so much humanity without sun and without sky hurts me too much to keep quiet." "I want to incite the people. I want to ignite them with the fire of my heart. I want to tell them the truth that a humble woman from the country- the first woman of the people who will not let herself be dazzled by power or glory- learned in the world of those who rule and govern humanity's people." "Finally, I want everyone to know that if I made mistakes, I made them out of love. I hope that God, who has always seen my heart, will judge me not by my mistakes or defects or my faults, which are many, but rather by the love that consumes my life." Evita Perón is a controversial personality, as there are those who hold that she was just a social climber trying to get back at the social elite which snubbed her. But putting aside her figure, we wonder how many Latin American politicians can actually say those same words without invoking derision. How about any of these people below ... ?